The four economists, mostly from the Chinese University of Hong Kong, are the latest in a long line of skeptics from both the West and mainland China. Indeed, controversy has surrounded China’s GDP figures since the late 1990s, when Chinese policymakers guaranteed GDP growth rates of around 8 percent—an impossibility given the turmoil in the region that weighed heavily on export growth, job creation, and energy utilization. In 2007, Li, then party secretary for Liaoning, even admitted to U.S. diplomats that China’s GDP number was “man-made” and “for reference only.” He relied instead on alternative figures, such as electricity consumption, railway freight, and bank loans—what became the aptly named “Li Keqiang index.” More recently, in December 2018, the Renmin University economics professor Xiang Songzuo publicly disclosed that some Chinese government research groups had found that last year’s growth, reported to be 6.6 percent, was actually 1.67 percent, or even negative. There are three main reasons for the skepticism. First, the quality of national GDP data has historically been compromised by inflation in the provincial data. Since economic performance is a prerequisite for promotion, local officials have long sought to overstate their output levels. Unsurprisingly, the sum of provincial GDP data vastly exceeds measures for national GDP, and provincial data on investment and economic output tend to be the most exaggerated. Data doctoring has been particularly pronounced in the northeastern industrial rust belt provinces of Heilongjiang, Jilin, and Liaoning. Liaoning, by far the most egregious data falsifier and the province where Li was formerly party secretary, was publicly denounced by the central government—a first for the party—in 2014. The National Audit Office reported that one Liaoning county inflated annual fiscal revenues by 127 percent. The province’s leadership, including the provincial chief, were made an example of and imprisoned over a separate vote-buying scandal. And now, after over a decade of adjusting local GDP data downward, the National Bureau of Statistics (NBS), China’s central statistics bureau, is assuming control of regional data collection from local bureaus starting this year. A second reason for skepticism is the approach that NBS statisticians use to calculate China’s GDP. China’s national accounting uses the value-added production method (the sum of net output of the agriculture, industry, and services sectors), which is a throwback to the Soviet Material Product System it inherited from the Soviet Union, when China was more of a centrally planned economy. By contrast, most developed economies, including the United States, use the expenditure method (the sum of consumption, gross capital formation, and net exports). In short, whereas China’s GDP accounting continues to focus on what the economy produces, the United States and others focus on what it consumes. The production approach seems oddly out of place now that the Chinese economy has been rebalanced to center on consumption and services. Given China’s data black box, it is impossible to know whether its growth figures are overstated, understated (especially in the services sector), or completely falsified. And that begs the question of why Li would have bothered to downgrade this year’s GDP projections at all. To put his move in historical perspective, this is the second time he has opted for a ranged target (the last time was in 2016, when the target was between 6.5 and 7 percent). The only other premier to do so was Li Peng in 1995. It is likely that the downgrade—and the greater flexibility implied by a ranged target—is an indication that the Chinese Communist Party is trying to clean up its act when it comes to its GDP calculations while seeking to gradually manage growth expectations down. This balancing act brings to mind the late 1990s, when Premier Zhu Rongji publicly cracked down on the “wind of falsification and embellishment” from local government bureaus while the government opted to cut the 1999 growth target from 8 percent to 7 percent. So why have a target at all? The answer is that the ghost of Deng Xiaoping, paramount leader and architect of China’s economic opening, hangs over all officials in Zhongnanhai, the CCP headquarters. Embedded in the CCP’s DNA is Deng’s call for a “moderately prosperous society” (xiaokang) by 2021, the centenary of the Communist Party’s establishment in China. Deng set the tradition of seeking to double GDP every decade, which was continued by his successors, Jiang Zemin and Hu Jintao, who pledged the doubling of 2010 GDP and per capita income by 2020. Xi enshrined that mandate in the 13th Five-Year Plan, meant to cover 2016 to 2020. But even so, Xi has focused party rhetoric increasingly around inclusive and high-quality growth rather than on hard targets. Xi has focused party rhetoric increasingly around inclusive and high-quality growth rather than on hard targets. 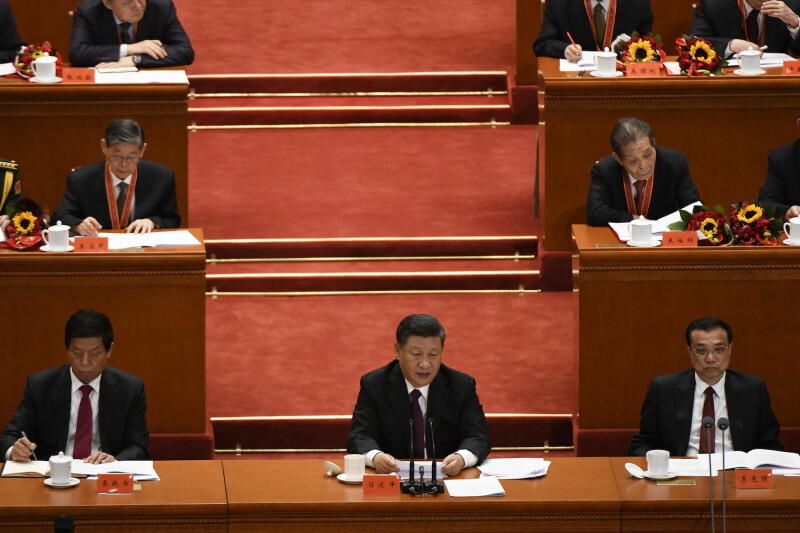 After the 19th Party Congress in October 2017, which was widely read as a mark of Xi’s consolidation of power within the party, his administration stated that the party would not set new doubling targets after 2020. And given that the party has overshot its growth targets in the past few years, it has leeway to go below 6.5 percent this year and next year and still meet the old doubling target. Validity of numbers aside, from a Western perspective, the GDP target is still an important form of political signaling. As the China expert Michael Pettis describesit, “reported GDP in China is no longer a measure of economic growth, but rather a measure of political intention.” Pettis characterizes China’s GDP as a systems input rather than an output. Within this framework, a softening in the GDP target should be read as an indicator of the political capital the party is willing to expend to tackle major structural issues, including the country’s vast debt, glut of investment, crowding out of the private sector by the state, and widespread pollution, to name but a few. In the meantime, the West would do well to look to other metrics such as tax revenue growth, bank loans, and online retail sales to assess an economy that is now over 18 percent of global GDP—almost five times more influential for the world economy than it was in 1987. But until Beijing can clean up its data and promise more data transparency in these metrics as well, China bears and bulls alike will remain obsessed with its GDP figure. Previous articleChina’s Slowdown Already Hit Its Factories. Now Its Offices Are Hurting, Too. Next articleChina is choosing a different approach to stimulus — is the world ready?